VFP3: Switch Control Pedal. Gold or Nichel finish commae. Rubber Contact open at rest. Supplied with cable and stereo jack plug. Natural single box. 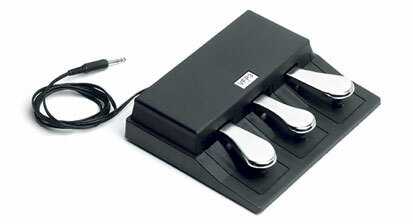 VFP3-D: Dynamic Control Pedal. Gold or Nichel finish commae. Rubber Contact open at rest on the central and left side and potentiometer control on the right side. Supplied with cable and stereo jack plug. Natural sigle box. VFP3-2D: Dynamic Control Pedal. Gold or Nichel finish commae. Rubber Contact open at rest on the central side and potentiometer control on the right and left side. Supplied with cable and stereo jack plug. Natural sigle box.